Stars And Garters: Friday Night Fights: Sugar Ray - Round 11: Redditor Edition! Friday Night Fights: Sugar Ray - Round 11: Redditor Edition! Usually I take my Friday Night Fights: Sugar Ray entries from superhero stories. 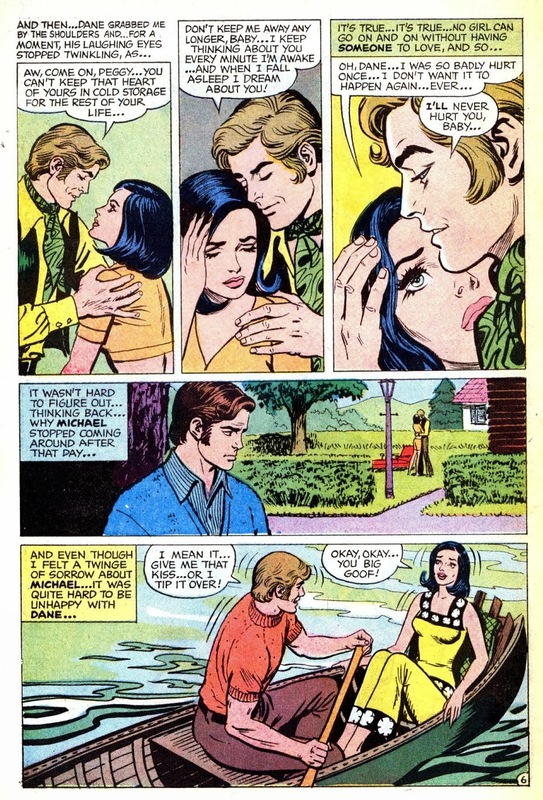 But because today is Valentine's Day, I'm using one of DC Comics' classic romance comics instead. 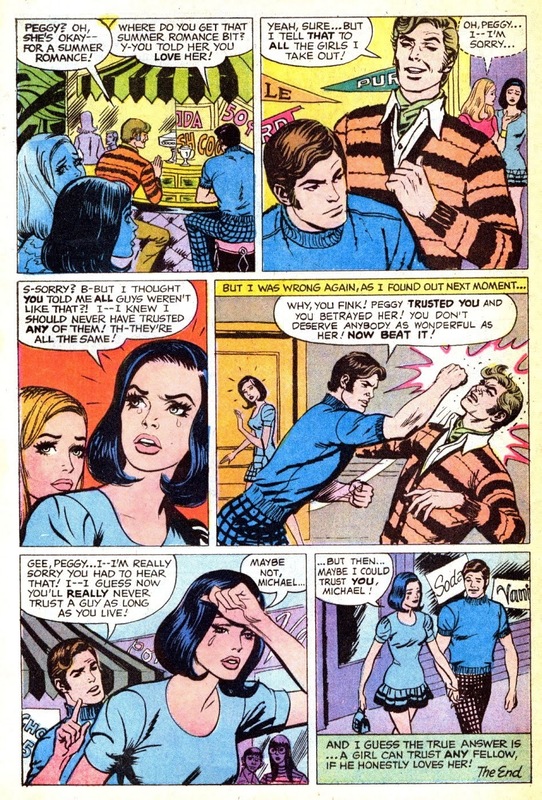 Tonight's amorous altercation comes from a story in Young Love#81 called "Don't Make Me Do It!". Unlike most of my FNF battles, the story from which this romantic rumble was derived is uncredited, and my internet searches to find the proper credits have been in vain. The art looks like Nick Cardy was involved in....some capacity. But the story, as you'll see, could have very well been written by someone on Reddit or 4Chan, or one of those Nice Guys Of OKCupid subjects. Synopsis: Peggy got her heart broken really badly by a guy. So she decides she can't trust guys and she'll never fall in love again. But then she meets Dane and Michael, both of whom simultaneously pursue her. So we have a tug-of-war between the sensitive, gentle, comfortable "nice guy" and the fiery, exciting, fun-living "bad boy". 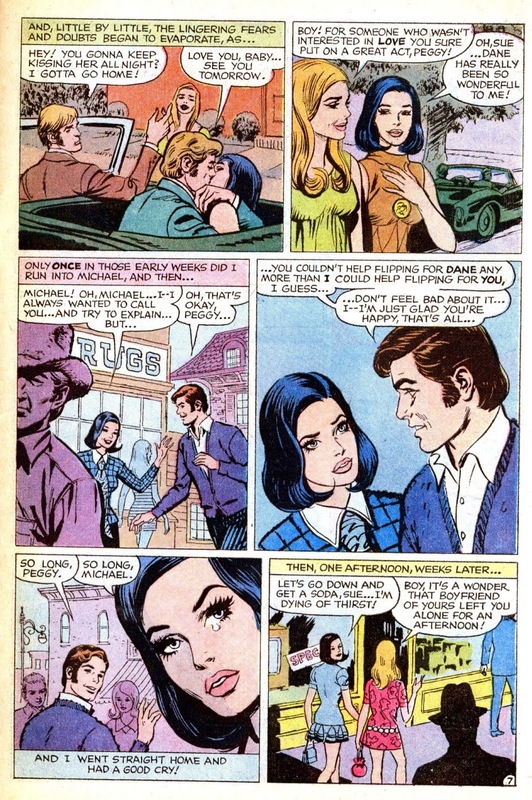 Seeing how this is a 70's DC romance comic, you can tell how the story's going to play out. Yes, that was the sound of a million guys in fedoras yelling "Friendzoned!" Ok, I know what you're thinking: Isn't this supposed to be "Friday Night Fights"? Where's the punching? The hitting? 1. Don't trust any guy who wears an ASCOT. 2. Sally P. was right. All romance comic heroes REALLY DO look like Hal Jordan! Tonight's fight music is this Shatnerian sonnet from Fear Of Pop. For more romantic encounters, click here. And don't forget to vote! It's true! So...so many Romance heroes look like Hal. A few like Guy, and even a couple like Kyle. Sadly, not like John. Or Kilowog. Ladies, that's YOUR loss! Gosh, I just love Romance Comics! They're hilarious!